Eco-Effective GreenPro Certified in Portland, Oregon. Our system is revolutionary and simple. We use contraceptives, instead of poisons, combined with a new humane trap system to help limit the rat population explosion in Portland. You, all by yourself, can make a positive environmental health impact by lowering the rat populations around your home, and incidentally, your neighbor’s homes. You can enroll in our Good Neighbor Backyard Rat Control and make a difference even if you are the only participant near you. When you see rats in in your yard, in broad daylight, you are witnessing an indicator of overpopulation. The rats are breeding too fast for the available shelter, and the young ones are being pushed out of the nesting areas during the middle of the day. Rats still thrive in our sewer system and there are many exit holes and broken pipes that allow the sewer rats to visit our yards. Some of our clients are afraid to let their small dogs or children out into the back yard. The larger dogs dig holes and destroy lawns to get at the rats. Are neighbors poisoning the rats? Are sick and dying rats ending up in your yard? Are you patrolling your yard for sick rats before you let the dogs out? Are rats tunneling in and out of block walls and other landscaping? 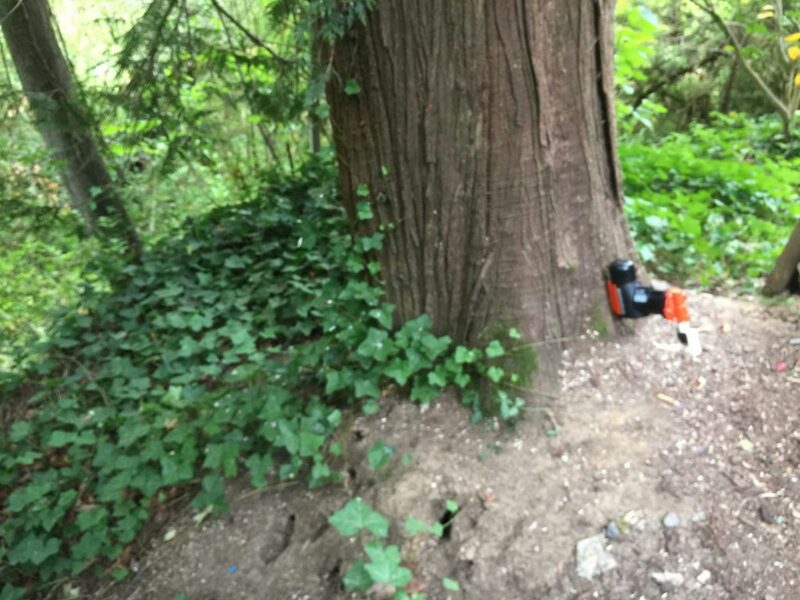 We see one hundred year old fir trees on steep hillsides in the west hills, that are being undermined by rats tunneling around their roots, because someone put a bird feeder on their deck near the tree. Rats tunnel to store extra food and black sunflower seeds are their favorite. Damage to the root system is very serious on a hill side. We know that rats in urban environments establish territorial feeding routes. These travel routes can be over one hundred yards long, with feeding and resting areas that include multiple properties. What do you do when your neighbors don’t seem to care if they are encouraging this population explosion? Your neighbors crawl space, shed, junk pile, or garage may be the home base for many rats. Is there a neighbor near you with piled up trash and weeds, upturned compost piles, pet food left out for the stray animals, piles of rotting bird seed on the ground, chicken coops poorly designed and maintained, fruit and garden produce left on the ground, dirty dog runs, abandoned ponds and water features? These conditions encourage overpopulation and cause the excess rats to test your foundation screens, dig under your deck or patio, to find new nesting and food storage areas. Now, you don’t have to feel helpless when your personal back yard space is invaded by rats. Studies have shown that significant, non-poison, rat population reductions are achieved by utilizing our contraceptive bait in combination with removing some rats with traps. Immediate trapping tends to remove some roving young male rats searching for a territory. This can make it easier for resident females to take the contraceptive, although the contraceptive works equally well on male rats. Some detective work is needed. Nature First will survey your property and look at the neighboring yards to determine rat travel routes and food sources. We use nontoxic bait feeding indicators to better identify areas where the rats feel comfortable enough to feed and interact with the contraceptives and traps. We inspect your home to make sure that rats are not living in a crawl space or attic without your knowledge. If they are, we will remove them without poison baits, or a lingering bad smell. After our detective completes his initial investigation, we place an enclosed, secured, contraceptive bait station where the rats will feel comfortable entering it. Male and female rats drink the liquid sweet bait and quickly become infertile. We regularly inspect and replenish the supply of the contraceptive liquid. Only licensed Portland pest control professionals can purchase this product. A major advantage our system has over poison placements is that contraceptives do not alter the behavior of rats like poison will. This method encourages normal breeding behaviors and promotes contraceptive consumption and a quicker population decline. We may place one or more A-24 automatic rat traps some distance from the contraceptive to achieve an immediate population reduction, and to encourage the more timid females to visit the station. The contraceptive quickly produces infertility in both males and females. This means that if a rat comes from a different area and is not sterile, they are still likely to mate with a sterile partner. Population reductions of over sixty percent have been achieved in two months. More neighbors using our Good Neighbor System would mean an even higher success rate in a given area. We offer discounts when several folks in the same area join. But remember, just one Good Neighbor can make a difference in the livability of their area. We encourage you to talk to your neighbors about this community threat. We will be happy to speak at neighborhood meetings and offer free advice on things a homeowner can do to reduce rat populations and damages. Call Nature First Pest Control and get a Rat Control Detective working on your case today!